This feature was a closed pilot experiment. This feature is not supported for new users. To use edX course content in the Canvas LMS, you add a new app to the course and then add external tool module items. This example relies on the use of a third-party tool. Because this tool is subject to change by its owner, the steps and illustrations provided here are intended as guidelines and not as exact procedures. In Canvas, select your course. In Settings, select Add New App. In Modules, add a new External Tool item. 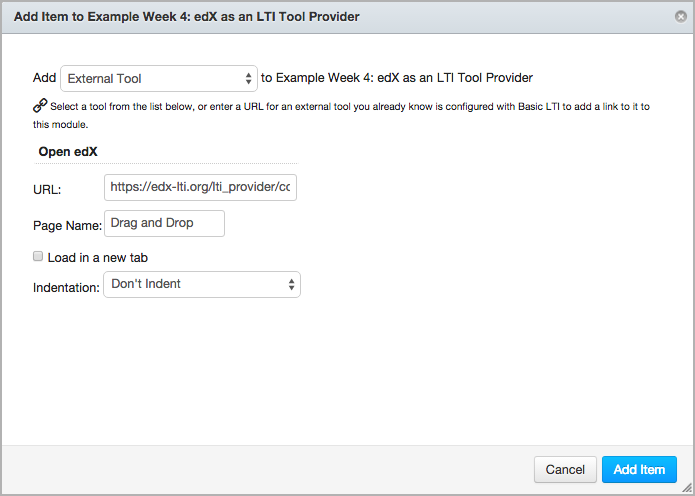 The URL is the LTI URL that you determined for the edX course content, such as https://edx-lti.org/lti_provider/courses/course-v1:edX+DemoX+2014/block-v1:edX+DemoX+Demo_Course+type@problem+block@d2e35c1d294b4ba0b3b1048615605d2a. For more information, see Determining Content Addresses. Review the content to verify that it appears as you expect.